Capture your fragile documents and artwork with uncompromising image quality and professional standards with the Kurabo K-IS-A0FW flatbed color scanner. 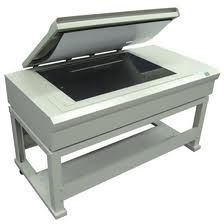 The Kurabo scanner features a 36"x50" flatbed scanning area, giving you the flexibility to scan just about any type of original by simply placing it directly on the scanner bed. It also features advanced CCD sensor technology, ensuring picture-perfect imaging performance with an optical resolution of 1000 dpi, and can scan a 36"x50â€ size document within 17 seconds! The Kurabo K-IS-A0FW is perfect for all your imaging needs, including textiles, fragile historical records, fine art and other delicate originals. The Kurabo scanner can capture a wide variety of documents and objects fast, accurately and efficiently.